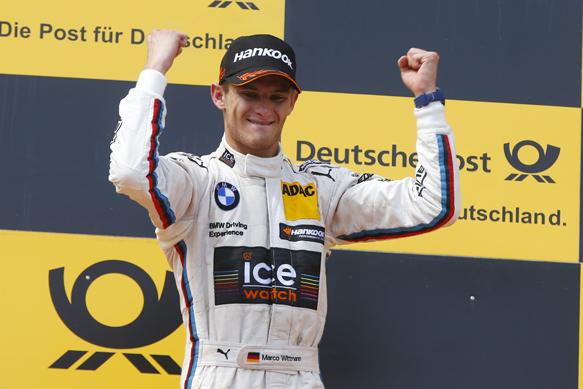 Marco Wittmann won a bizarre sixth race of the DTM season at the Red Bull Ring in Austria. 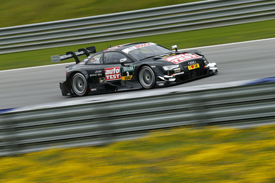 The current points leader wound up having little opposition on his way to victory, his BMW team-mates Timo Glock and Augusto Farfus - who flew the Bavarian flag at the front for the majority of the race - gave Wittmann an easy passage to the front as Mercedes' and Audi's best challengers fell out of contention. Wittmann, who only took over the lead on lap 32 of 47, then had a three-BMW deep train consisting of Farfus, Glock and Martin Tomzcyk to play rear-gunner behind him, helping him to a comfortable third win of the season. For BMW to get into a position where it could control the race, it took two strange drive-through penalties. The first came for Audi's Jamie Green, who jumped into a surprise lead on the 24th lap when he stayed out on the option tyre a lap longer than the rest of the leaders. However, it was soon revealed that the extra lap took him over the half the race distance on the softer tyres, meaning he was forced to serve a drive-through penalty, taking him out of contention and leaving him eighth at the finish. Then, Mercedes' best chance at a result was also given a penalty, thanks to an unsafe release of Robert Wickens during the stops. Despite being told he would have to tour through the pitlane, Wickens proceeded to charge into the lead past Farfus and stayed out for a whole six laps before eventually pulling into the pits and immediately retiring the car - leaving the four BMWs clear at the front. Behind the leading BMWs, Timo Scheider turned 15th on the grid into fifth thanks to clever use of the option-to-standard strategy, while Adrien Tambay came from even further back from 20th to finish sixth. Mattias Ekstrom finished seventh and best of the runners to start on the standard and switch to the option, having been let past Green on the final lap. Christian Vietoris, meanwhile, was the best of the Mercedes in ninth, having spent the majority of the race leading the charge of those on the softer tyres in the second stint. But he lost out to Ekstrom after running wide trying to pass Green at Turn 2 a couple of laps from the end of the race.